You chose biology because you're passionate about studying the world and its many forms of life, right? We take that passion and enhance it by offering immersion into cultures you may have never seen before. You can live and learn somewhere far from home and see, touch, taste, and smell things you may have never dreamed would be part of getting a biology degree. These experiences happen hand-in-hand with student/faculty research opportunities, cool internships, and hands-on classes so it all contributes toward a powerful education that will take you places. We are pleased to welcome to UW-Eau Claire Dr. Mallika Kumar and her students from the Shri Ram Delhi College of Commerce at Delhi University. They will be on campus Oct. 10-13. 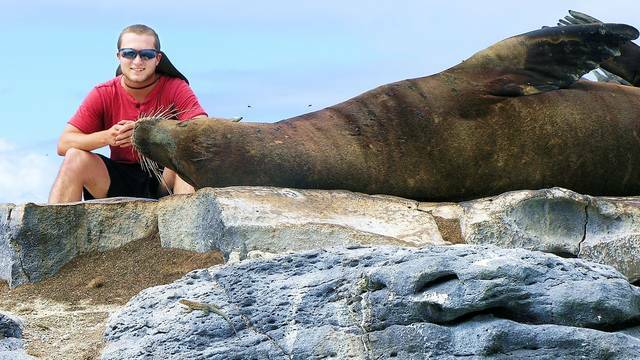 Biology major Brady Olson spent the summer in the Galápagos Islands studying the behavior of an invasive species of insect that is threatening local bird populations.